To begin with, to obtain crystals you need an item with durability and Scroll of Destruction. Having both of them in the backpack, you can try your luck to obtain the crystal. Using the scroll on the item, will make the item disappear, without possibility to get it back. At the same time, with enough luck, you will receive one of the special crystals. The probability of obtaining the crystal depends on the durability of an item. The higher the durability, the more chance of getting a crystal. 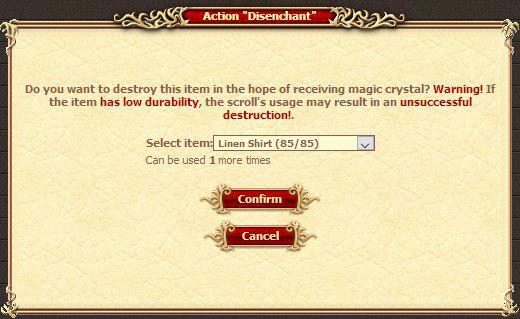 In order to have maximum chances of obtatining one, you need to destroy a new item. With each repair of an item the chances decrease. The color of the item you destroy determines the color of the crystal you will get. Grey resulting in Grey, Green in Green, Blue in Blue, Purple in Purple and Red in Red. Shop in Ridge of Kayar / Shop in Village of Maettro. After clicking on the scroll, a dialog box will appear in which you will have to select the item you want to destroy. After pressing the "Confirm" button the chosen item will be destroyed. however if you won't be lucky enough to receive a crystal the scroll will remain in your backpack. As stated before the color of the crystal depends on the color of the chosen item. The size of the crystal depends on the level of the item. Level 1 - Level 5, gives a high possibility of obtaining small crystal and low possibility of obtaining medium crystal. Level 6 - Level 10, gives a high possibility of obtaining medium crystal and low possibility of obtaining large crystal. Level 11 - Level 15, gives a high possibility of obtaining large crystal and low possibility of obtaining massive crystal. Level 16 - Level 20, gives a high possibility of obtaining massive crystal. for example Leather Vest won't be shown in the box due to having no durability. with no probability to obtain a crystal. Rings, amulets, bags, backpacks, belts and quivers cannot be destroyed. Unlike quivers, bows can be destroyed. When you get last of the achivements, whole world of faeo will be notified about it, by the message in chat. As it was already mentioned above, color and size of the crystal is determined by the item we destroy. But what crystals are actually needed for and which crystals do you need? While developing in the game you will notice that some of the quests require crystals to complete them. For example Gizdor’s Task or Battle of the War Mages quests. However, this is not the only use of crystals. Most importantly, jewelers use crystals to make runes you can put into armor. This way you can improve your attributes and get harder to overcome in the fights. Depending on the type of rune, different crystals will be needed to make them. Small crystals are used for runes for level 1-5 armor. Medium crystals are used for runes for level 6-10 armor. Large crystals are used for runes for level 11-15 armor. Massive crystals are used for runes for level 16-20 armor. For green rune you will need grey and green crystals. For blue rune you will need green and blue crystals. Purple and red crystals have no application in the game at the moment. With the exception of Large Shining Crystal which can be used in the elt cube to receive a key exchangable for City reputation.